Intrigued by the idea of combining business, investment and philanthropy, I embarked on a journey to explore social entrepreneurship and impact investing after a two-year stint in the banking industry. At a China-focused social venture capital firm, I got a taste of utilizing impact investments as tools for inclusive socioeconomic development. Later, at the Clinton Global Initiative (CGI), I saw firsthand the potential of public-private partnerships to alleviate some of the world’s most pressing social issues, particularly within the agriculture and health care sectors. At CGI, I focused on building strategies to support businesses in reorienting their core business practices for sustainability. I was able to observe a “solution revolution” in action – a global and progressive rethinking of the ideology that businesses should serve only to maximize shareholder profit. Through CGI, I saw that some of the world’s most powerful businesses are realizing tangible benefits that come with investing for social impact. 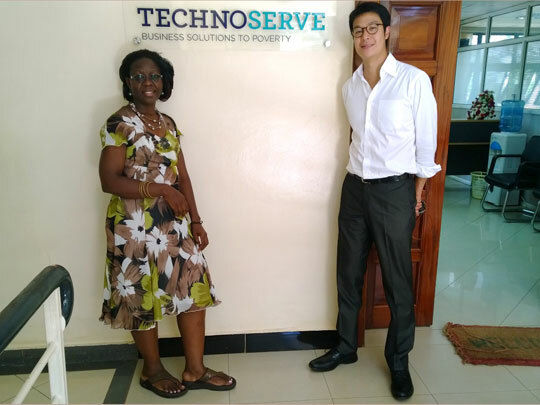 In January 2014, I joined TechnoServe as a Volunteer Consultant to lead an initiative to map the food sector in Uganda as part of the Solutions for African Food Enterprises (SAFE) program. In partnership with the U.S. Agency for International Development (USAID), TechnoServe is working with Partners in Food Solutions (PFS), a consortium of General Mills, Cargill, Royal DSM and Bühler, to transfer technical and business expertise to African food processors. Employee volunteers from the partner companies work with TechnoServe staff on the ground to share knowledge and technology with small businesses for a long-term solution to hunger and food insecurity. TechnoServe and PFS are currently working in Ethiopia, Kenya, Malawi, Tanzania and Zambia to expand the availability of safe, nutritious, affordable processed food. This will also create new markets for many smallholder farmers. The partners are looking at potential expansion into Uganda, where the alliance looks to strengthen food processors and the local institutions to support them to provide solutions for systemic and chronic food insecurity. Over the course of three months, a TechnoServe food technologist, Dr. Dorothy Nakimbugwe, and I consulted with close to 100 stakeholders along the food processing value chain – including grain millers, oilseed processors, dairy manufacturers, industry associations, international aid agencies, government entities, foundations and capacity builders – to understand business challenges in the food processing sector on both the demand and supply side. We learned that many challenges persist in the food-processing sector in Uganda, including limited working capital, analytical capacity and operating expertise. Related: Check out TechnoServe’s Annual Report here. How do you increase the affordability and accessibility of nutritious and fortified foods in Uganda? An obvious solution would be to increase production of fortified foods. But convincing Ugandan consumers to change their buying and eating habits would require extensive education, marketing and generational cultural adaptation. In one supermarket visit, we found two packets of maize flour – one fortified, the other not, produced by the same company, placed next to each other, with both selling at 15,000 Ugandan shillings. This phenomenon is not uncommon in Uganda and points to the fact that food processors lack economic incentives to sell these products in the market. Another complication is that most processors are technologically incapable of conducting food fortification, which would require additional equipment and know-how. But market demand is simply not strong enough to encourage processors to fortify their products. Failures in the market deter farmers from adopting best practices for harvesting and handling, which in turn floods the market with low-quality crops for raw materials. The inefficiencies along the value chains coupled with poor infrastructure and limited regulations drive up costs and hold down crop prices and farmer incomes. To fill these gaps, PFS and TechnoServe, with USAID support, aim to catalyze transformational change at the food-processing level. As a consultant, I analyzed household expenditure and food consumption trends, food production and cross-border trade data, food security profiles, and agriculture business models to map out constraints and opportunities for the food-processing industry. With such information at hand, I proposed three public-private intervention models that have the potential to catalyze industry-wide impact. Dr. Dorothy Nakimbugwe (left) and the author led the mapping study for SAFE in Uganda between January and March 2014. One model recognizes the ongoing efforts to support food production and proposes SAFE capacity building for small and growing businesses (SGBs) to link with technical expertise and to provide information on quality control practices that will help develop a reliable market. The second model proposes SAFE to complement existing efforts of the Uganda National Bureau of Standards by building the capacity of food-processing SGBs to meet regulatory, food safety and certification requirements. This model reinforces the previous intervention model by ensuring the sustainability of small and medium-sized food processors. The final model proposes SAFE build the capacity of existing analytical labs at public institutions, including Makerere University, the country’s leading higher education institution, to address the limited analytical services that were raised as a priority issue by all interviewed stakeholders. I believe SAFE has the potential to kickstart a process of development around building a more food-secure world. Clinton Wong is a volunteer consultant with TechnoServe.